Deadline of early-bird registration for 32nd JSSX Annual Meeting in Tokyo is October 6, 2017. Please join us. Call for Abstracts in 32nd JSSX Annual Meeting in Tokyo will be closed on Aug 14, 2017. Please join us. Call for Abstracts in 32nd JSSX Annual Meeting opens on June 5, 2017. 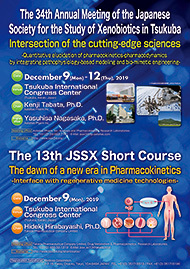 Website for 33rd JSSX Annual Meeting and 22nd MDO in 2018 has been opened. Website for 32nd JSSX Annual Meeting in Tokyo (November 29-December 1, 2017) has been opened. Drug Metabolism and Pharmacokinetics (DMPK) is the English journal published by JSSX. Copyright (C) 2013 JSSX. All Rights Reserved.